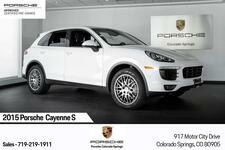 Certified Pre-Owned 2018 Cayenne S E-Hybrid in White over Black Leather interior. 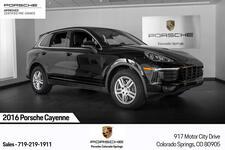 This Plug-In Hybrid was ordered and sold new here at Porsche Colorado Springs to one of our regular enthusiast friends that took great care of the car and its overall condition shows very clean. 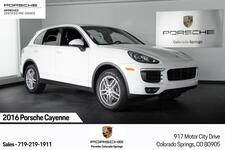 The Cayenne had an MSRP of $93,490 including nearly $10,000 in factory options and now has Porsche's Unlimited Mile Certified Pre-Owned Warranty until January 2, 2024. Our Factory Trained Technicians have been servicing the Cayenne S E-Hybrid since new and just completed the 111-Point Certified Pre-Owned inspection to ensure the car is as like new as it can be for the next owner. 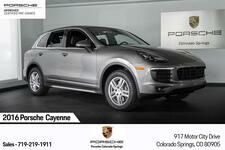 The previous owner just had the 1st annual service performed including Oil and Filter Change and this Cayenne also comes with the 2nd annual maintenance included which is a $900 value already included.